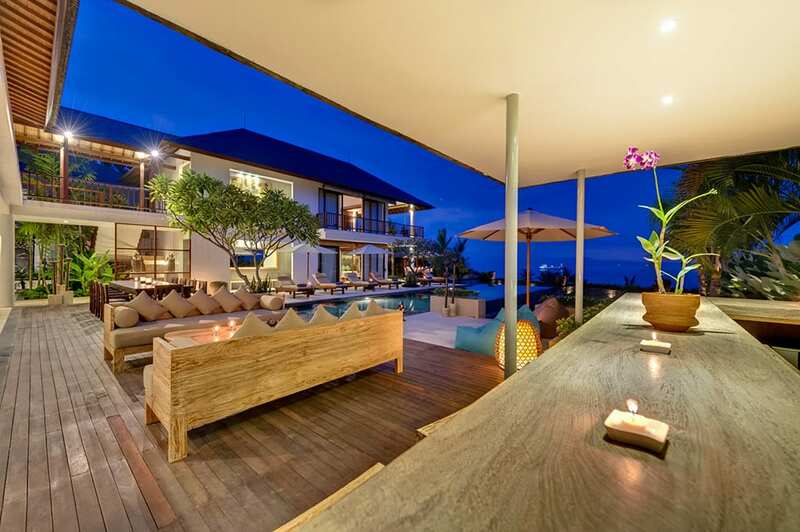 If lazy days next to the sea and sophisticated seclusion are more your style than bright lights and action packed nights, then Villa Asada may be the perfect Bali villa for you. 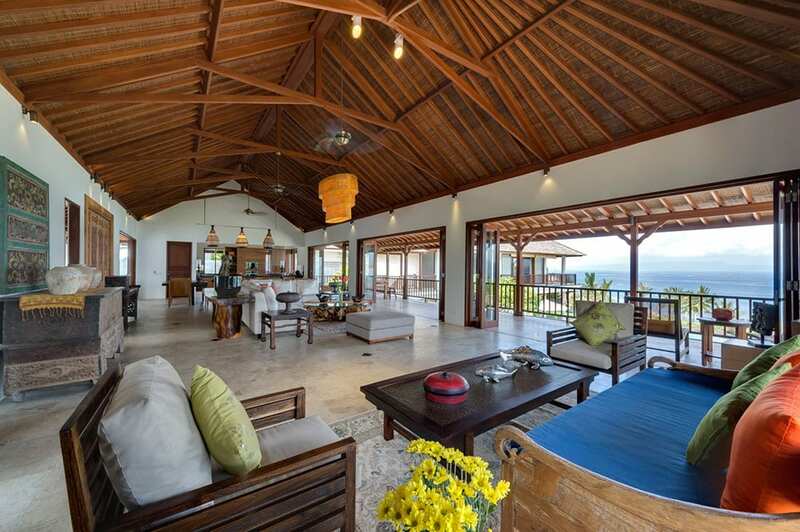 This spacious 4-bedroom holiday home sits on a hilltop overlooking Labuan Amuk Bay near Candidasa, and you can spend your time here watching fishing boats bob on the ocean, chilling out next to the pool, and enjoying sumptuous dinner parties or family barbecues under the stars. Plus, the contemporary ambiance, abundance of indoor and outdoor living spaces, and modern conveniences make this the perfect location for group getaways, weddings, and special events. 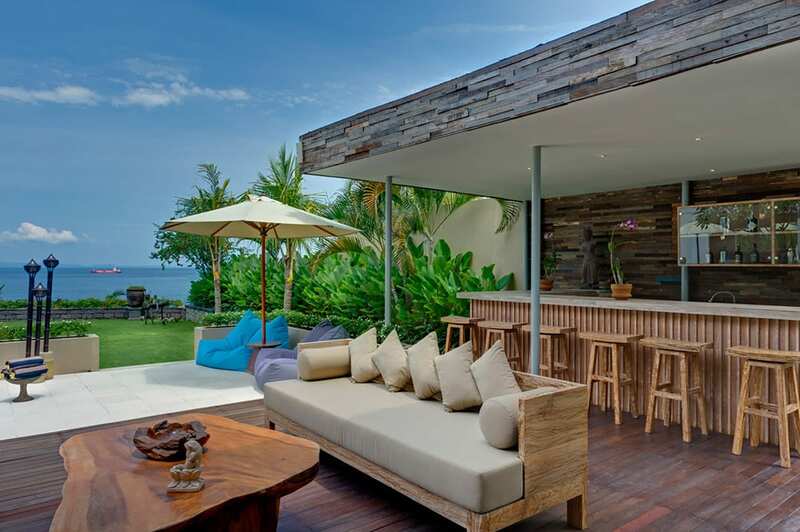 Villa Asada is the perfect escape from the hedonism of south Bali, as it rests on private property just 100 metres from the ocean in rural East Bali. 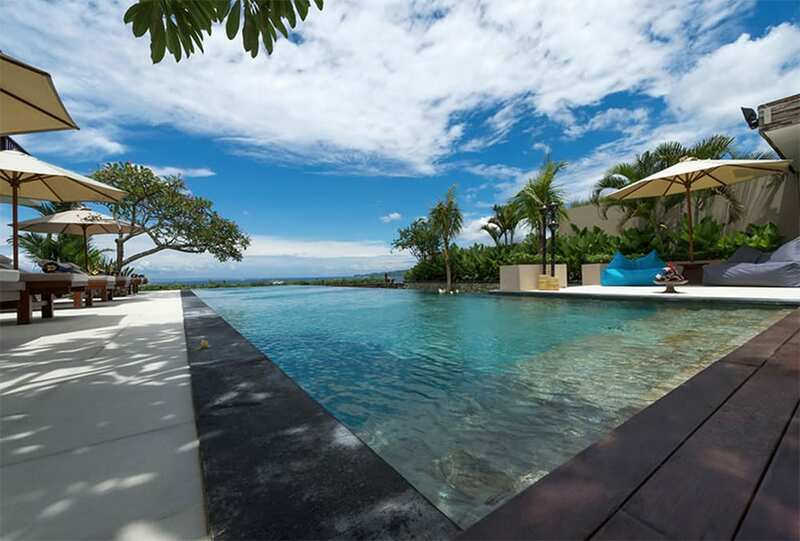 Although the locale is blissfully free of crowds and chaos, it is just a short drive to the shops, restaurants and cafes of Candidasa, as well as two of East Bali’s five-star resorts, Amankila and Alila Manggis. However, you might just find that leaving the villa is challenging, as the sweeping ocean views, manicured lawns, breezy terraces, 18-metre infinity pool and bright and airy rooms decked out in soft sofas, solid wood tables, antiques and colourful artworks leave you wanting for nothing. In addition, state-of-the-art amenities like A/C, flat screen TVs, and surround sound make this a truly luxurious home away from home. You enter the villa on the top floor of the main pavilion, where you will find the open-plan living and dining room with its long comfy couches, soaring ceilings, antique furnishings and a huge wooden dining table that can seat up to 12 people. French doors open up to a sea-facing balcony with another table for al fresco meals overlooking the water. 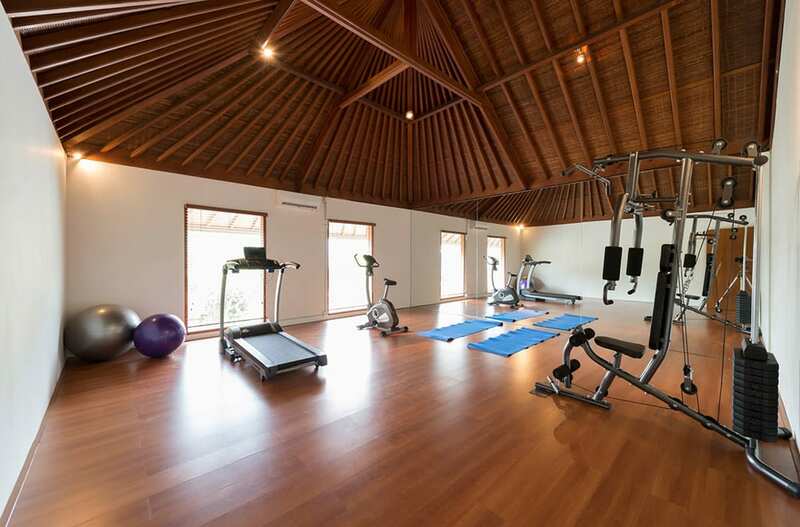 This floor also has a designer kitchen outfitted with everything you need to cook home cooked meals, as well as separate staff area where the villa chef will prepare you gourmet dishes. 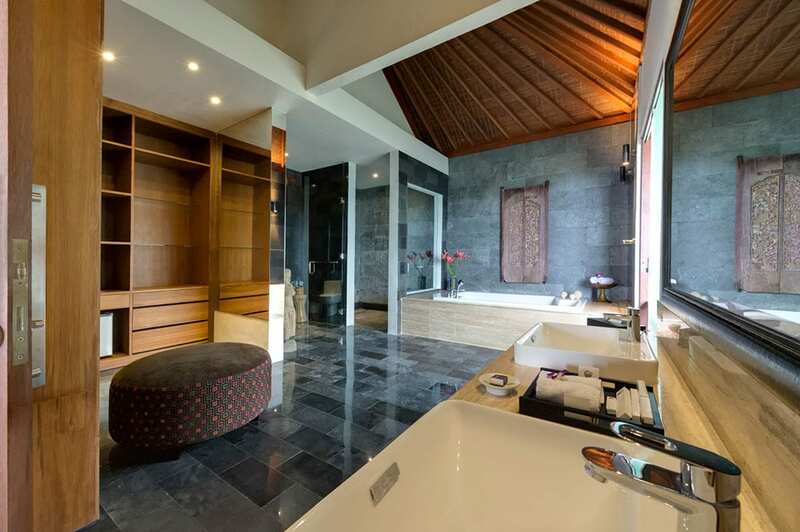 The bottom floor of the main villa pavilion is dedicated to the entertainment room and two guest bedrooms, each of which have queen sized beds, polished wooden floors, bright decor, ensuite bathrooms with bathtubs and rain showers, and doors that lead out to the pool and terrace. Between the two guest rooms there is an air-conditioned TV room with a huge flat screen TV, surround sound system, couches and beanbag chairs. 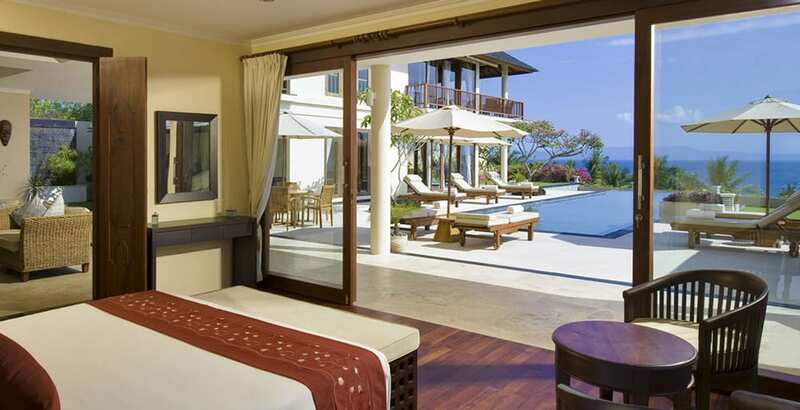 A second villa pavilion has a master bedroom on each floor. The upstairs master bedroom has high ceilings, a king bed draped in mosquito netting, a black-tiled ensuite bathroom with a large tub and monsoon shower, and a private balcony where you can soak up the sea views. The downstairs master bedroom is similar to the upstairs room, but with the added bonus of a door that leads directly to the terrace and pool, and an open-air shower in the spacious ensuite bathroom. The garden area is where you will probably spend most of your time, as you’ll find plenty of sun loungers and umbrellas to recline on, the inviting infinity pool that looks out over the ocean, and a fully stocked bar on the wooden pool deck with comfortable bar stools and a cozy seating area with beanbag chairs. 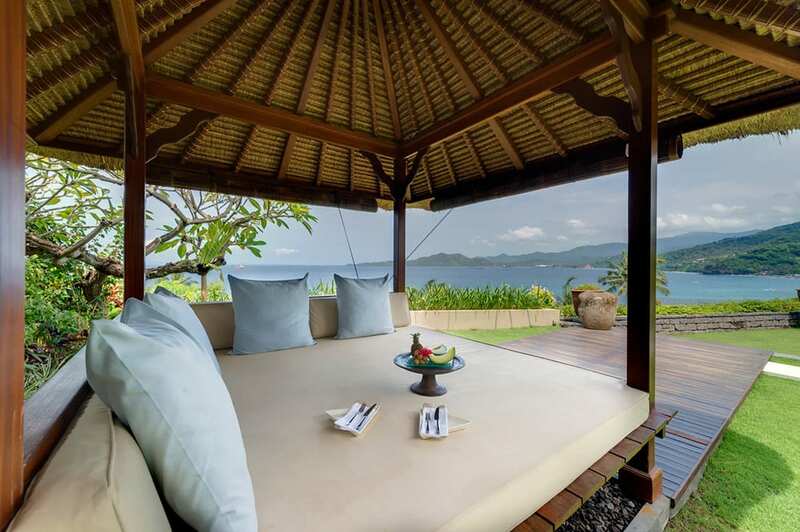 On the terrace there is also a long 10-seater table for meals under the blue skies or stars, and just beyond you will find a tennis table area and a Balinese bale perched on the edge of the cliff. LOCATION Candidasa, East Bali, Indonesia. CAPACITY Capacity 8 adults plus two children (two air conditioned master suites with king beds, two air conditioned guestrooms also with king-size beds, two extra beds at US$35 per night each). LIVING AREAS One indoor living and dining room (fan cooled) with dining table for 12, one indoor air conditioned living room with TV/DVD player & surround sound, outdoor dining on the balcony for 6, outdoor dining on the pool terrace for table for 10, outdoor seating on the pool terrace, poolside bar with stools, one outdoor covered bale. STAFF Manager, 1 butler, 2 cooks, 3 villa attendants, 1 gardener, 2 security guards. DINING A wide variety of Western and Asian dishes. Requests accommodated (including special diets). COMMUNICATION WiFi broadband internet access. Local telephone access via mobile phone. ENTERTAINMENT iPod docking station and iPod adapter on stereo in downstairs living room. Three cable-channel TVs; three DVD players and movies; books; stereo system with CD player, Surround-sound speakers in downstairs living room. FOR FAMILIES DVDs; board games, high chair; baby cot, staff willing to assist with children (daytime) when parents present. TRANSPORT Car and driver available 8 hours per day at USD$25++ per day, excluding petrol. EVENTS Villa Asada presents the perfect setting for weddings, parties and other special events. ADDITIONAL Full back-up diesel powered electrical generator. PROPERTY AREA 1,300 sqm (villa). 1,500 sqm (land). The moment I found the villa, I fell in love with it. My family and I do love Villa Asada. The awesome seascape is so enchanting and the lasting sound of surges is soothing. Being indoor, I feel close to the ocean. Plus, it has the most hospitable staff, who make our stay even more enjoyable. Thanks to them, we felt at home and had a great vacation! You Will Love Villa Asada! We stayed at Villa Asasda for 7 nights with our three children aged 8,11 and 12 along with another family of 4. We had previously spent time in Candidasa and loved the laid back feel in comparison to Kuta. Villa Asada is stunning (5 Star) and run by an excellent team who go out of their way to make your stay a great experience. I can not imagine a better setting for a relaxing holiday. Beautiful expansive home with a truly spectacular view of the water. But, what made it even more special was the warm attentive staff. They could not do enough to make our vacation even more special. I had a Birthday while there and they created a complete festival including floating candles in the pool at night. It was one of my best celebrations ever. We would come back and visit this gem of a vacation home again and again. 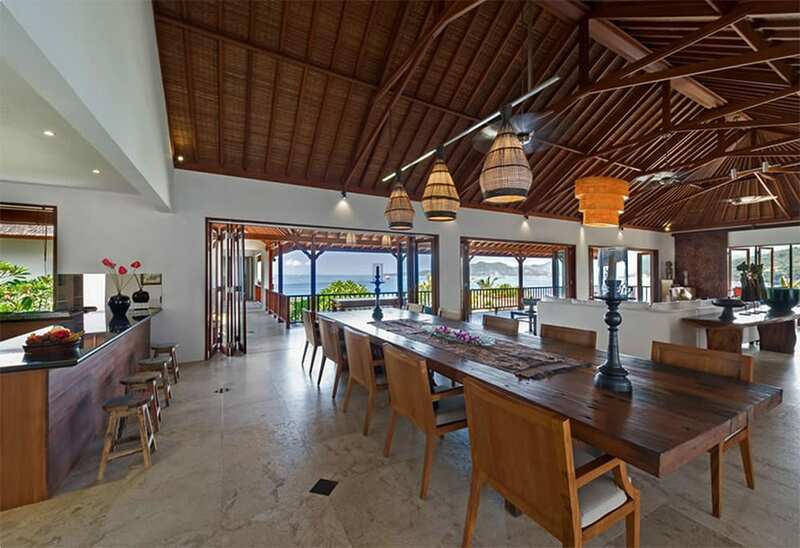 With tropical-chic architecture and decor, Tirta Nila Beach House is a stunning 4-bedroom luxury villa located right on the water in the Candidasa area of Bali’s picturesque and unspoiled East coast. Sleeps up to 8 Guests.